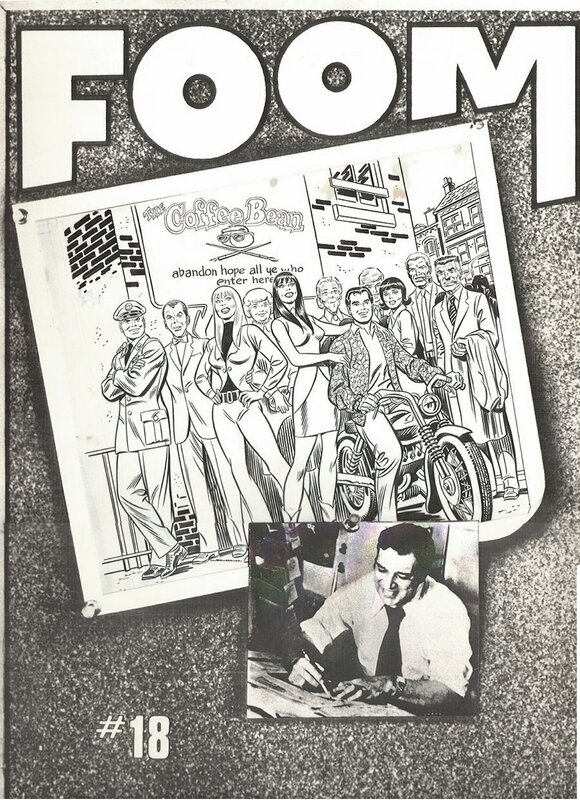 Romitaman Original Comic Book Art :: Private Collection :: FOOM Magazine by artist John Romita Sr. Page: COVER (1977) SOLD SOLD SOLD! Click Here To See Untouched Drawn Cover Art With No Stats! Check out this "AMAZING" 1977 cover which was penciled AND INKED by the great JOHN ROMITA! This incredible cover has all of the elements that made THE AMAZING SPIDER-MAN comic book so...AMAZING...and that was...the characters....THE AMAZING SPIDER-MAN was the GREATEST soap Opera EVER in comics! A CHARACTER page from one of Steve Ditko's or John Romita's Spidey books was as important and sometimes even MORE IMPORTANT compared to the action scenes! NO WHERE ELSE in comics was this more apparent than in AMAZING SPIDER-MAN! This AMAZING cover has ALL "11" PROMINENT CHARACTERS that make up the stories Which Stan Lee turned into REAL LIE for us comic book fans in the 1960's! This cover features the entire gang in front of their favorite 1960's hangout... "THE COFFEE BEAN!"... 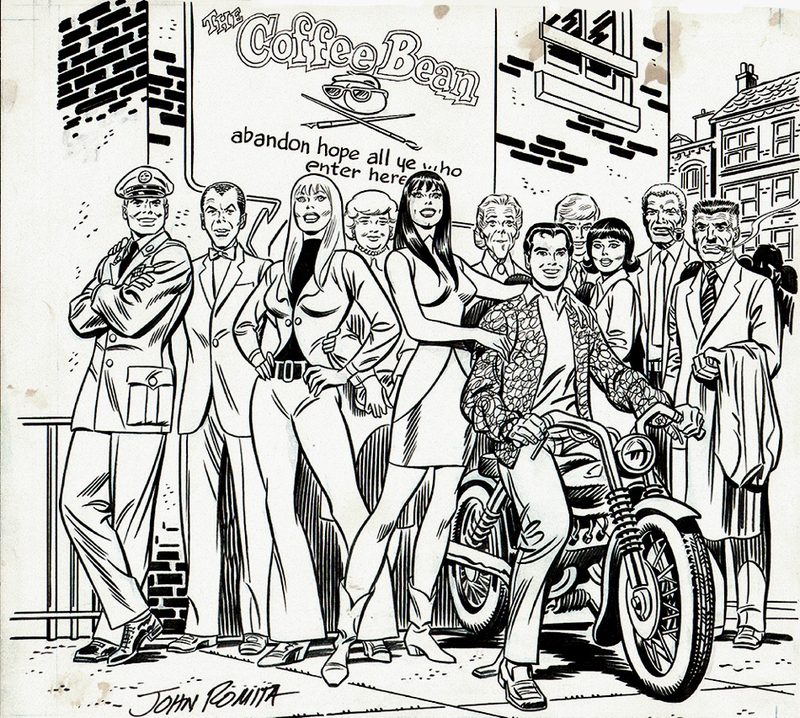 We have the 1960's versions of: (From Front to back) Peter Parker on his motorcycle, Mary Jane Watson with her arms around Peter, Gwen Stacy, Flash Thompson in his 1960's Vietnam Era Military outfit, Harry Osborn, Anna May Watson, Aunt May, Ned Leeds holding Betty Brant, Robby Robertson with a pipe in his mouth, and J. Jonah Jameson smoking his famous cigar! This cover art has a made to go over top of the art so it looks like the published magazine! Cover measures a HUGE 17.75 by 23 INCHES from top to bottom... and the actual DRAWN art image measures 12.5 wide by 11.5 tall and is almost the same art size as a large art Silver Age cover minus the logo area and word balloons above it! PLEASE check out the RED LINK ABOVE to see this art in all its AMAZING glory without the cover overlay, as there is more art to see under the cover stat, plus John Romita's super signature is also there! LOL ALL HIGH end pieces of art, including this one, are able to be purchased with VERY fair time payment plan options, and trades are always considered towards this and any other pieces of art on my site here! Just send me an email and we can try to work something out.